TAJAMUKA/SESIJIKILE spokesperson, Promise Mkwananzi, has been suspended for a year over alleged abuse of donor funds and usurping the oversight role of the pressure group’s finance committee. A tribunal to look into Mkwananzi’s matter was set up on October 5 to inquire into the litany of allegations against the former spokesperson before unanimously agreeing to suspend him for a year. He was found guilty of misappropriating and wrongly disbursing funds in the name of the campaign, despite having the full knowledge that this was a preserve of the finance committee. “Mobilising financial resources in the name of the campaign, well knowing that he was not a member of the finance committee, failing to surrender to the finance committee all funds received by him in the name of the Trust, and consequently failing to account for those funds,” the tribunal report read. Although he avoided appearing before the disciplinary panel, Mkwananzi was found guilty of embezzling thousands of dollars and diverting the group’s funds to buy a Subaru car. Charges against Mkwananzi rose a few months ago after he reportedly attacked the groups benefactor, Fadziso Jena, who is based in the United States of America. She accused Mkwananzi of misappropriating the funds she had sent to help the group in its activities. 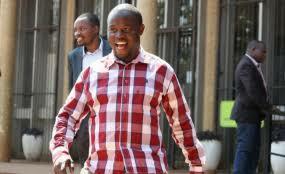 Tajamuka led a series of anti-government demonstrations last year. The tribunal slapped Mkwananzi with a year’s suspension in which he will further be barred from any of the campaign’s activities and ordered him to further return the purported $8 750, which he stole from the organisation’s coffers for personal use. “Mr Promise Mkwananzi be suspended from the campaign for a period of one year, taking effect from 30 November 2017; that at the completion of the one-year suspension, he be barred from joining any of the committees of the campaign for a period of five years,” added the tribunal’s report.